A container of beautiful bright red cranberries came in my CSA box this week. I wasn’t immediately sure what I wanted to do with them, but I knew I needed to move quickly or the cranberries would be consigned to shrivel quietly in the back of the fridge. I still had a ton of apples and pears left from my previous box, plus a new influx in this week’s box, plus two wine-poached pears left over from the amazing party on Sunday that I still need to write a post about. Disher, my picky eater, is terribly fond of apple crisp, so I instant messaged him to find out if cranberries were on the list of acceptable foods. “I eat all of those things. 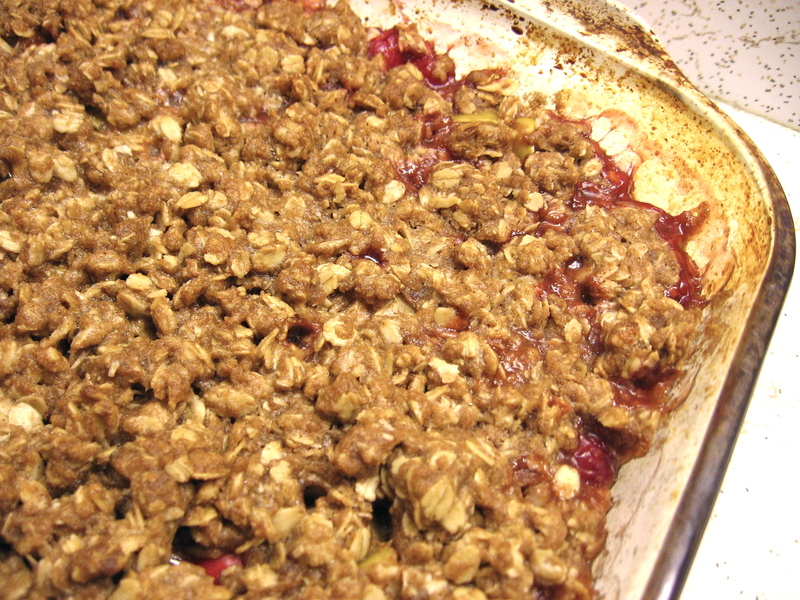 Eagerly,” was his reply when I broached the idea of an apple, pear, and cranberry crisp. Excellent! I’d found the dish I wanted to make, found someone to eat it, and was ready to go. So my improvised crisp turned out pretty fantastically, if I do say so myself. I asked the picky eater if he had any feedback for improving the next crisp and he basically said, “Change nothing. Oh, but maybe serve it in a different bowl.” (Apparently he has trouble scooping every last morsel out of my square bowls.) When they’re focusing on the tableware, you know you’ve done a good job! I liked the autumn flavor and texture so much that I’m planning to make another one next week for Thanksgiving. I’m not hosting this year, so this will be the first time in a few years that the dinner is not entirely vegan, but I’m going to do my best to contribute as many delicious vegan dishes as possible. Preheat oven to 375 degrees. Grease 9×12 casserole (that’s the large brownie-pan size). In a large bowl, mix filling ingredients. In a medium-sized bowl, mix oats, GF flour, xanthan gum, brown sugar, and cinnamon. Cut in coconut oil and Earth Balance and then crumble with your clean hands until the mixture is entirely incorporated. Spread filling on the bottom of the casserole dish. With your hands, scatter the filling across the top until it covers the surface fairly evenly. Bake for 45 minutes, or until the top is starting to crisp and the fruit is cooked through. 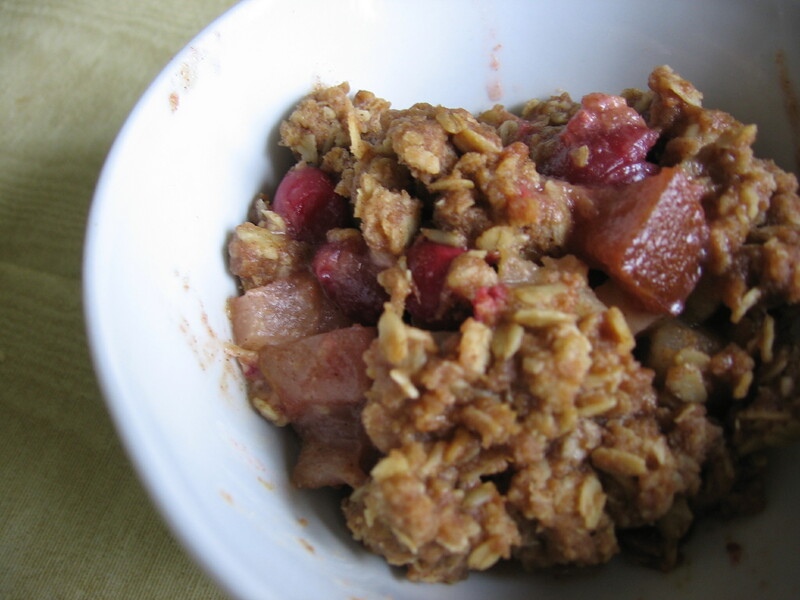 This entry was posted in CSA, Recipes, What I did with my box and tagged apple, cranberry, gluten-free, pear, vegan.